Truck and camper combinations and eventual suspension configurations are often unique. Each requires a different package. For ours, BF Goodrich, E-rated, 10+2 ply, A/T 275/70R/18 tires establish the suspension base; ours are rated for 3594# each. 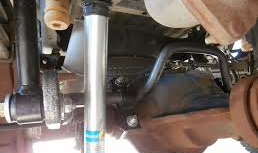 We have installed Lance cab-over struts to address 'porpoising', Model SS13 Supersprings to establish a loaded level ride and Bilstein Series 5100 RV grade shocks to control suspension flex and rebound. Presently, all of these suspension upgrades have made a significant improvement to the safe drive-ability of our truck & camper combination. However, there is still a minor amount of body sway apparent under certain driving conditions. The Hellwig Big Wig anti-sway bar (rear) has been designed specifically to address the body roll that can occur with trucks that haul top heavy slide-in campers. Technician Riley Paddock, at Cannifton Garage in Cannifton removes the Fords rear anti-sway bar. The stock bar was installed below and behind the rear differential. Original: Ford bar on top. Upgrade: Hellwig Big Wig bar below. 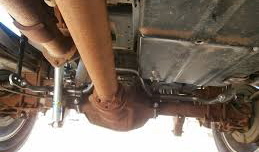 The Hellwig bar is installed above and in front of the rear differential and was set to the firmest locater. The only remaining suspension upgrades that could still be done (to address sway) would be the addition of a front anti-sway bar and I believe that would only have a minimal affect. Offset wheels (19" or 20" super-singles) could be exchanged for the stock 18" wheels next time we do a tire change. This would allow for a slightly wider tire to be used: a 285, 295 or 305 to replace the 275 series. but once again the added cost may not be worthwhile. We won't know how effective this upgrade is until we haul the camper around for another extended trip, but other TC owners I have spoken with tell me that I won't even notice the 4000# in the bed. Time will tell.